Coming Fall 2012 > The MOSAIC RILEY Rowhomes on Burke Mountain is a new collection of two, three and four bedroom Coquitlam townhouse residences in this well sought after location. Priced from $349,900 (subject to change at any time), the new Coquitlam RILEY Burke Mountain Townhomes by MOSAIC is one of those projects that should be categorized in the ‘must-see’ section for those who want detailed craftsmanship, well thought out functional floor plans, amazing value and a great location. For those who are not familiar with the Burke Mountain real estate district, this is one of Coquitlam’s finest neighbourhoods. The new Burke Mountain RILEY Coquitlam rowhomes will give homebuyers another opportunity to call this community home. 2 to 4 bedroom floor plans available in The Foothills of Burke Mountain neighbourhood, this master planned community by MOSAIC Homes will feature well detailed, classic exteriors that are inspired by English style Tudor architecture. In addition, the homes at the RILEY Coquitlam Rowhomes will feature back yards that are accessible from the main living room on the main floor. Some of the thoughtful details includes bathrooms on the main level as well in addition to four bedroom spacious floor plans that are ideal for growing families. 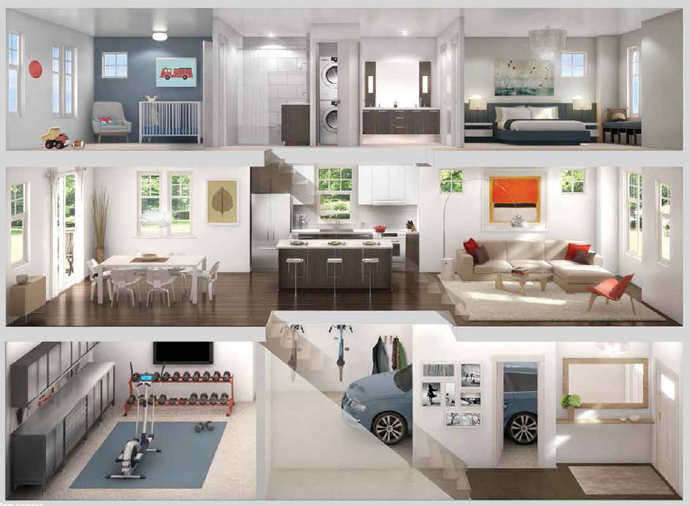 Some of the new Burke Mountain Coquitlam RILEY Rowhomes by MOSAIC will also feature side-by-side car garages, which is a great bonus! These townhouses won’t last long with the design, price point and location so make sure you register online at www.mosaichomes.com today! Please note that all images are courtesy of MOSAIC Homes. 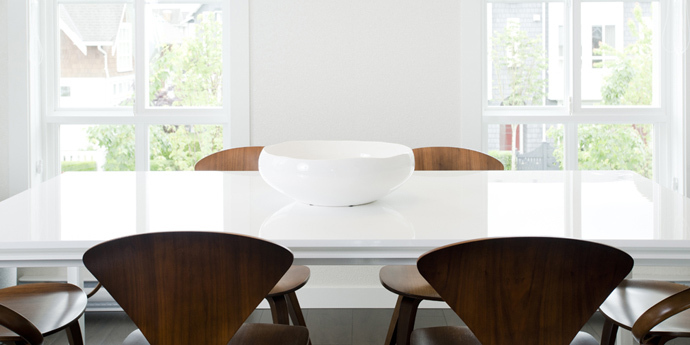 In the market to purchase a home in the Coquitlam real estate market place? Want to take advantage of an affordable Coquitlam townhouse project at ultra low mortgage rates that won’t last long? Introducing the new Coquitlam RILEY Tudor Rowhomes. RILEY. BY MOSAIC. This is one of our favourite locations and favourite boutique builders with a long history of exceptional offerings, detailed finishes and craftsmanship unlike any other local developer. The new Coquitlam RILEY Tudor Rowhomes features an affordable price point starting from just $349,900 and this boutique Coquitlam real estate development offers only 91 opportunities to today’s homebuyers. Presales at the RILEY Coquitlam Townhomes is expected to start Fall 2012 and it is already under construction and accepting priority registrations for this preview opening. Most of the new Coquitlam RILEY Tudor Rowhomes by MOSAIC are 3 level residences with floor plans that range in size between 1,181 square feet to over 1,680 square feet (all approximate from draft layouts). As well, the Foothills of Burke Mountain Coquitlam RILEY Townhomes feature contemporary interiors with powder rooms on the main floor as well as yards off of the main level living area which is perfect for families with children and pets. The English Tudor style architecture will feature everything from functional and beautiful bay windows to brick work and views of the Burke Mountain area. RILEY by MOSAIC is 2, 3 and 4 bedroom Tudor rowhomes on masterplanned Burke Mountain Coquitlam real estate district. Creekside and southern outlooks, a short walk to parks and future schools, community centre and village shopping, the new Coquitlam RILEY Rowhomes are also just a short drive to Coquitlam Centre, Newport Village and Fremont Village. 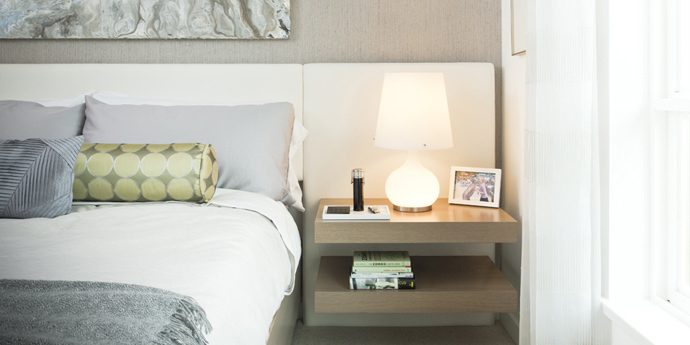 The homes at RILEY Coquitlam Burke Mountain townhomes feature powder rooms and yards off the main level of living. Other interior finishes include wood laminate flooring throughout the main and floor plans with 2-car side-by-side garages. The first look at the new Coquitlam RILEY by MOSAIC Burke Mountain rowhomes features traditional and angled bay windows that extend your living space. From $349,900*. There’s plenty more to tell you. The MOSAIC RILEY floor plans (draft layouts) include Plan A which is a 2 bedroom plus 2 bathroom home at 1,169 square feet. The lower floor is the double tandem garage while the main floor has a large living, flow through dining and kitchen with centre island and a patio. The upper layout has 2 large bedrooms, linen closet, washer/dryer closet and 2 full baths. Floor Plan B at RILEY Coquitlam townhomes for sale are larger at 1,693 square footage and is a corner 4 bedroom plus 3.5 bath row home. The lower floor has a double side-by-side garage, storage area, bedroom, full bath and the main floor has a very spacious gourmet kitchen (with centre island), dining, living space, large patio, entrance hall, powder room (convenient!) and a work niche/nook. The upper floor of this new Burke Mountain Coquitlam RILEY townhome pan features 3 bedrooms, 2 full baths (the master ensuite having double sinks, and separate tub from shower), a laundry closet with side-by-side washer/dryer, and a second bath. The MOSAIC RILEY floor plan D is a 3 bedroom and 2.5 bath townhouse layout which features a tandem garage in the basement with store room, living/dining open concept living with a kitchen and powder room on the main as well as the bedrooms and 2 full bathrooms and laundry closet upstairs. With homes starting from $349,900, there is no better time to purchase a new MOSAIC RILEY Coquitlam townhome today! These 2, 3 and 3 bedroom RILEY Tudor Rowhomes by MOSAIC feature floor plans between the high 1100 sqft range to close to 1700 sqft (all draft and approximate at this time). The interior designer chosen by MOSAIC Homes for the new RILEY Coquitlam townhome project is award winning and world renowned Portico Design Group while the architecture is by award winning Raymond Letkeman Architects. The Tudor style architecture is unique to the MOSAIC Home brand and the level of detailing and custom service that MOSAIC Homes presents to prospective homebuyers is unsurpassed in this market. The Tudor Rowhomes at RILEY Coquitlam townhome project are located in The Foothills of Burke Mountain Coquitlam real estate district, which is one of the most sought after neighbourhoods in the entire Tri-Cities area. Just a short drive away from Fremont Village, Newport Village and the Coquitlam Town Centre, residents at the new RILEY MOSAIC townhomes will be centrally located close to shopping, big box retailers, major transit routes, public transportation, recreational options, urban parks, top ranked and new schools for all ages, dining and entertainment. You will also be very close to downtown Vancouver. The Foothills of Burke Mountain Coquitlam is one of the most promising neighbourhoods for first time homebuyers, professional couples and families of all ages. A short walk away from the project site at the MOSAIC RILEY Coquitlam Townhomes will be a future middle school, a shopping area and a community centre as well. As a resident at the Foothills of Burke Mountain, you will be literally surrounded by nature, shopping, schools, restaurants and parks. These convenient and essential amenities and services will be just minutes away from your front door, an advantage of living in an already established Foothills of Burke Mountain Coquitlam real estate district. 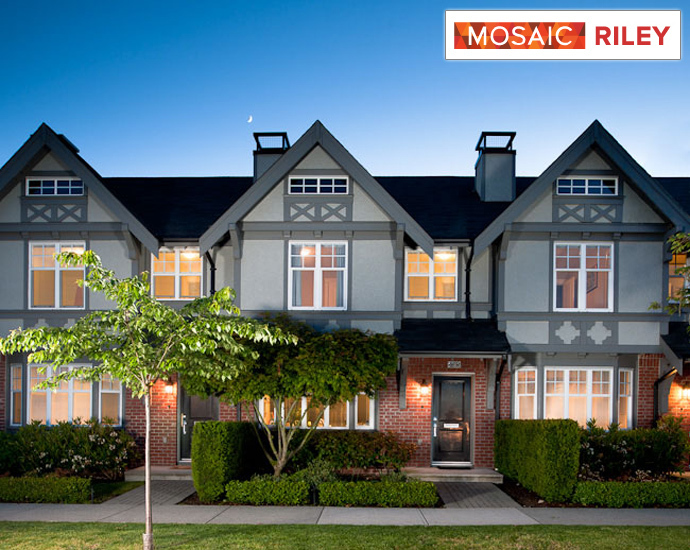 As mentioned above, MOSAIC is well known for their architectural style, and the RILEY Coquitlam Townhomes at The Foothills of Burke Mountain will feature English traditional Tudor style facades that are beautiful. From angled bay windows to professionally designed and landscaped English gardens, the homes at RILEY Coquitlam Townhomes are some of the best we’ve seen. In addition, there are decorative wood work follies, intricate brickwork design and pitched gables that give it a truly established and unique look and feel. The Burke Mountain Coquitlam RILEY Townhomes will also feature backyards that are ideal for home buyers with children and pets in addition to attached garages. The two bedroom homes at RILEY Coquitlam Rowhomes on Burke Mountain will be suitable for downsizers, retirees and professional singles and couples. The larger 4 bedroom homes are catered towards growing families. There is definitely something for everyone right here at the Burke Mountain RILEY Coquitlam townhouse project by MOSAIC Homes. The best part of it all is that the 2 bedroom residences start from just $349,900, making them truly affordable for The Foothills on Burke Mountain community. The well situated Foothills Coquitlam community is within steps to local amenities as well as outdoor recreation. The new Coquitlam RILEY Rowhomes will be centrally located within the Burke Mountain community which is master planned from ground up, giving you easy access to new schools, urban parks, hiking/biking trails, new dining, new retail shopping and a lot more! Just think of The Foothills on Burke Mountain as the new Westwood Plateau Coquitlam real estate neighbourhood. Get in before everyone else does! Other highlights that are within a short drive from your preconstruction Coquitlam RILEY Townhouse includes the new Fremont Village shopping district, New Port Village as well as Coquitlam Town Centre. There will also be a new middle school and community centre coming soon in addition to a protected creek just west of the new Burke Mountain RILEY Rowhomes in Coquitlam. Last but not least, all MOSAIC Homes are protected by the new home warranty and in addition, you will have the best service around by the MOSAIC Homeowner Care Team. *Prices are subject to change. This is not an offering for sale. E.&O.E.